As the Jij’s collective from Ghent (Jij’s is an acronym of initials of architects vylder vinck taillieu, complemented by Serge Vandenhove) the team scales down to product level. As a design collective they can act on their ideas for designs that arise in their architectural practice. Their ODE PDB design for PROOFFLab is a modular cabinet which references industrial constructions in its steel cross-supports and uprights, while quotes of high design are expressed in an optional choice of materials. Characteristic of the architecture office, architects vylder vinck taillieu, is that their interventions restructure what’s already there, so that it becomes narrative. 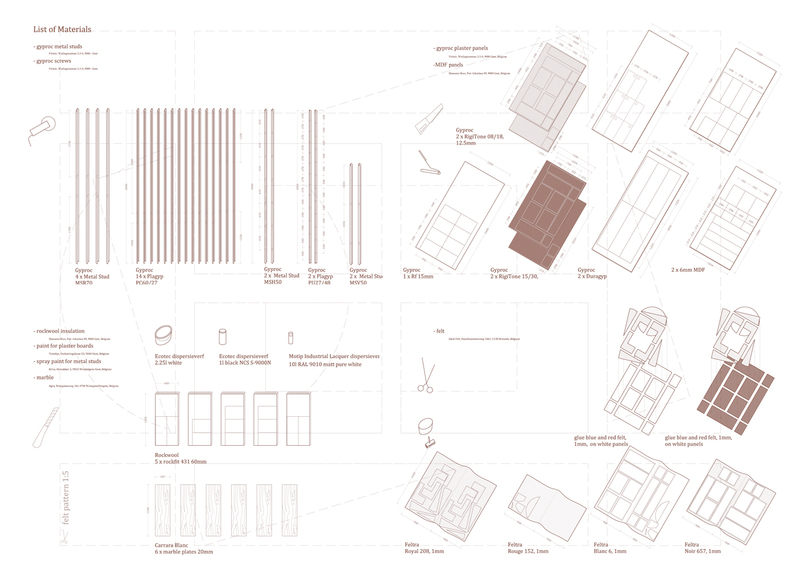 Intuitive visualizations of a context form the basis for new ways to deal with spaces. By keeping the design open to change, the inhabitants and users of a space are made participants in the design process. They perform a balancing act between an idea, its construction, context and how space can be defined, or maybe even deformed. This practice is integrated in the objects they develop as the jij’s. copying and using what already exists, rough materials as finished – is a big part of a dvvt and jij’s designs. If a certain, already existing, system or material fits their aim, they won’t hesitate to insert it into their design pieces. 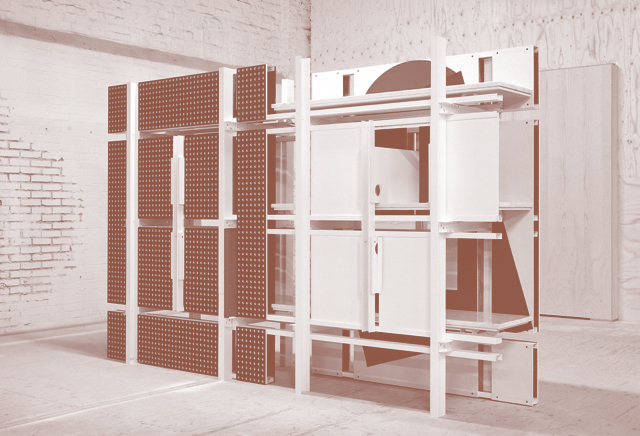 The ODE PDB design cites a cabinet by renowned Belgian furniture maker Pieter de Bruyne, ‘Day and Night’. This piece of furniture combines material with referential properties and plays on architecture, memories, geometry, light and structure. Other references are the shelving installations of Maarten Van Severen and Ray and Charles Eames, who’s modernist ambition was to make design accessible for the masses. ODE PDB juxtaposes the best of the designs it refers to. In a way, high and low design, modern pioneering designs and heavy-duty shelving are set side by side to highlight the strengths of both. The industrial design is revealed as far more democratizing than the expensive Eames icons. On the other hand, standardized furniture systems lack the democracy of individual choice. Purchasers of the ODE PDB can stay within their personal standards and choose the materials of their liking and budget. In its new context, the prefabricated wall system can take on a variety of configurations fitting to any intervention of space, view and sound. In the end, costumers purchase a blue print, the architect’s drawing hours, the cabinet maker’s hours and materials, which they can select from a catalogue. With Jij’s, architects vylder vinck taillieu have drawn objects and furniture outside their practice more than once. But for architects vylder vinck taillieu this is no different than their in their own practice. Unless Serge Vandenhove completes the group with ‘s: Jij’s is nothing less than the – first letters of – first names which, in the practice name, surnames are preceded by the word architects. In 2011, the first exercises are presented. Several exercises were arranged in series. Series of tables. Series of cabinets. Sometimes a thought apart. Such as a small table and thoughts on porcelain. Some exercises were no less than a real assignment. Other exercises saw their start because tones announced themselves. And some, long slumbering thoughts saw their first opportunity. Each exercise; each series arrived at its own outcome. There it was. But perhaps moreover, each exercise and each series is the ultimate mental exercise. 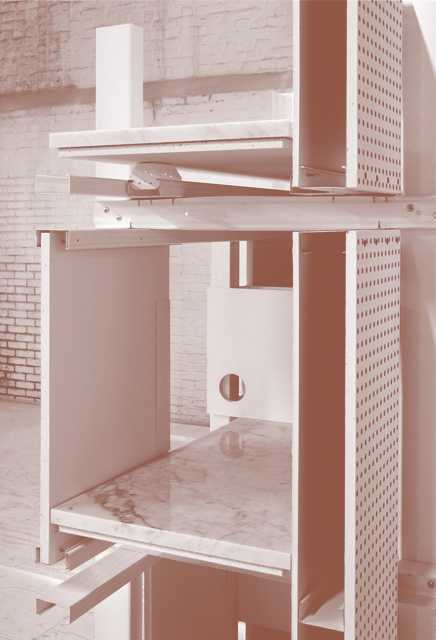 A sequence of cabinets was an exercise that had long been waiting. The architects vylder vinck taillieu practice has made use of industrial metal shelving of the brand TIXIT since long. As furniture. Even once as an actual bearer. At some point, a research is conducted into adjusting the standard elements of which the frame is made. A shelf becomes a worktable. Adjusting elements. Or even inventing new elements or parts. This becomes the predominant thought. The thoughts remain thoughts. Until 2011. To continue the thought practice and to be able to show the first outcome, a number of prototypes is set in motion. The prototypes don’t differ in function or size. Or not at random. That would certainly be unwanted. In the architects vylder vinck taillieu practice context is leitmotif. Developing an object or piece of furniture, it seems to lack every context as first. Odd. By way of exercise, reference is taken as a beginning. In the architects vylder vinck taillieu practice context is leitmotif, but reference is just as well. 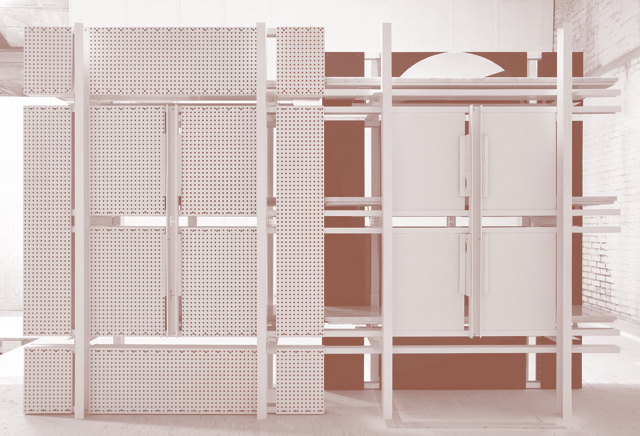 The prototypes of the TIXIT series – the cabinets -; examples become a guideline. 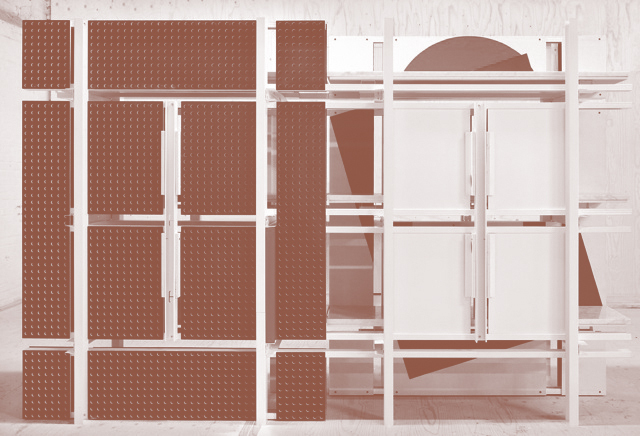 The cabinet with sliding doors in the colors of Maarten Van Severen. The cabinet by Ray and Charles Eames. This idea of ​​examples is taken as a second leitmotif, in addition to merely examining how adjustments can make the industrial frame completely different. It’s a second leitmotif that doesn’t interfere with the first leitmotif – technical exploration – with any need for concept or design. Focus on detail, detail that should match the example. Detail that, in further developing, can support itself enough to increases the chances on making a completely new system. A system that will fit perfectly into that recognized flexibility TIXIT has been for decades. Contemplating on how existing systems – call it context – can be valued differently -. The aim is that Jij’s has something to do with the architects vylder vinck taillieu. It is only occasional that the Jij’s operate. That architects vylder vinck taillieu becomes Jij’s. With Serge. The TIXIT version MVS and EAM are Jij’s reflection on Maarten Van Severen and Ray and Charles Eames and simultaneously on TIXIT. The issue at hand isn’t very straightforward. Definitely not average. But what seems odd at first sight, may get unexpected results that might even be more likely than the ‘odd’ would suggest. 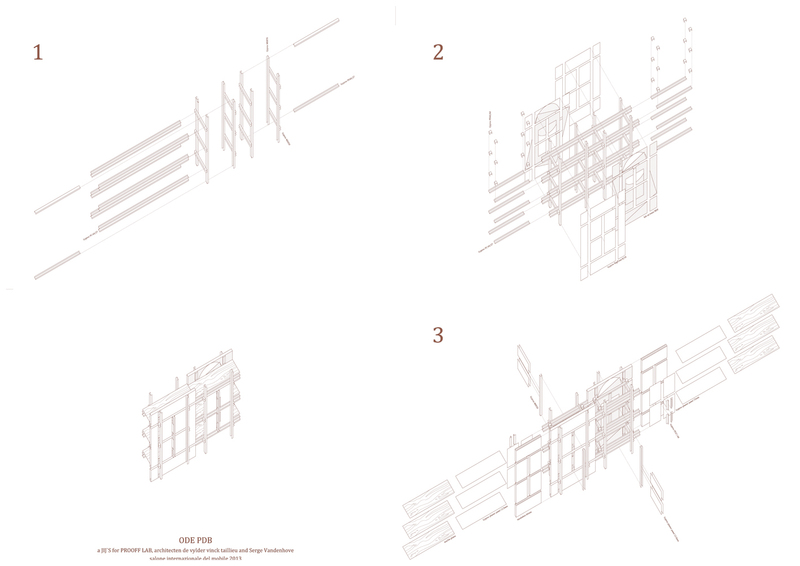 The technology of light weight walls and partitioners belongs to the modern principles of office building. Flexibility, but also optimal separation – acoustics -, light weight walls make this technically feasible. The technology consists of parts. Plates, lines, fittings. These can all divide in the right way. Absorb in the right way. Separating and absorbing sound. But apart from this quality, it’s a wonderful world of parts and elements that inspires architects vylder vinck taillieu. Jij’s wants to disassembe and reassemble the standard assembly into a completely unexpected unity. A cabinet. Again the leitmotif to use the context as a starting point, but simultaneously manipulate it. And again the second leitmotiv serves as a reference, to repose with and enjoy the pleasures of technique. Pieter De Bruyne is the reference. A cabinet of Pieter De Bruyne. The deformation, simultaneously being a composition. That’s inspiring. Pieter De Bruyne has been a fascination for a very long time. His idiosyncratic position in the landscape of Flemish architecture, not only because of the person Pieter De Bruyne itself; rather because of the connection that the work of Pieter De Bruyne makes with the international trends, and again: in his own way. Critical, but inspiring. GYPROC here, is the TIXIT. GYPROC here, is the brand that precedes all others. As TIXIT does as well. It is not a partition wall. Not in the way it was meant by GYPROC. It is a partition wall. A cabinet anyway. As Prooff probably probably meant here by posing this question. An object that changes acoustics. An object that changes the room. Each object does that. This object does it with the space itself: the folds of the wall open. 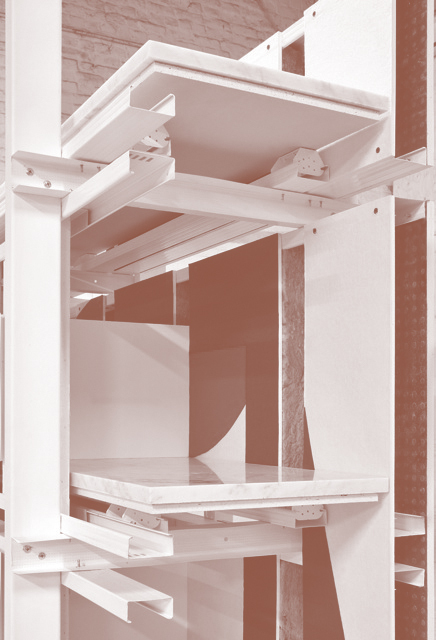 architects vylder vinck taillieu – read: Jij’s – show the cabinet PDB for PROOFFlab. It is a cabinet, but it’s also acoustics. 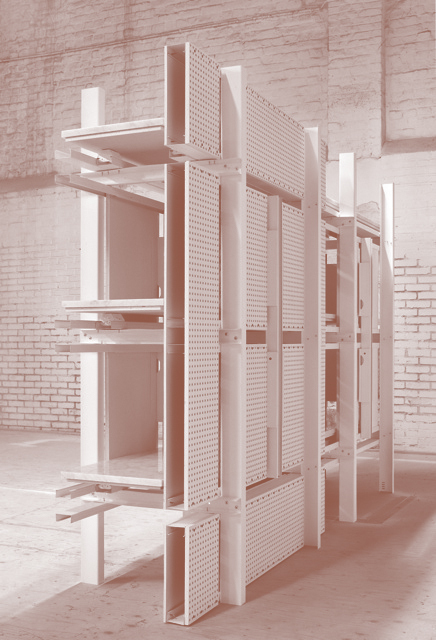 The GYPROC light weight wall system is deployed into a seemingly modular system. Pieter De Bruyne draws the system, his thoughts. At least, Jij’s perception of them.